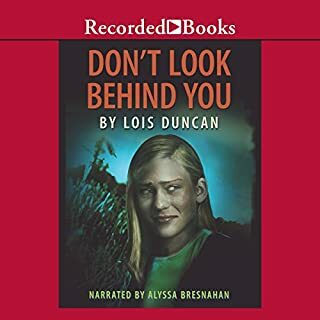 Where does Don't Look Behind You rank among all the audiobooks you’ve listened to so far? DLBY by L. Duncan is a great high interest accessible book for readers. I would place it in the top 20 books I have listened to with my students. What other book might you compare Don't Look Behind You to and why? Holes by L. Sachaar. Holes has clear heroes who must persist with difficult situations and conflicts. It has a strong sense of family too. My favorite character is April's Dad. He realized what he had missed in life, and was honest about it. He took the chance and although the whole family had hardship and thankfully remained safe, Dad had his moment of greatness. A story of mystery, hit men, and mayhem. Thirteen-year-old Mark Harrison has a week to hike across the desert. He will meet his parents on the other side. By his fourth day, he’s made good time. As he settles in for the night, he gazes up at the stars, feeling completely content. Suddenly, a blue light streams from the sky, jolting Mark into another dimension. Now, in a land filled with strange jungle animals and primitive tribes, Mark desperately battles hunger, armed enemies, and superhuman powers. A sequel is much needed! 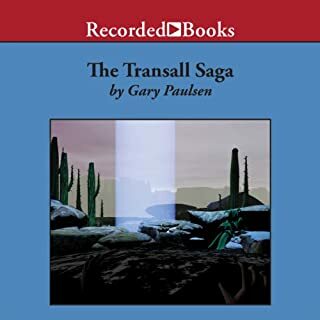 Would you listen to The Transall Saga again? Why? Transall Saga is a story of personal grit. I like to think I have grit in tough situations. What other book might you compare The Transall Saga to and why? I would compare the Outsiders to Transall Saga. In both stories a young teen boy finds themselves in situations both unexpected and challenging. They learn they have strength and can handle the outcomes. Which character – as performed by Johnny Heller – was your favorite? J. H. does a great job portraying Mark. I especially like the way he plays out the humorous self-talk Mark is carrying on in the first days and weeks in the new place. Although this book did not cause strong "feels", I did relate to the elements of loyalty and commitment as displayed through Gary Paulsen's characters. Kids where I work do not have many opportunities to try their mettle. Cleary Gary Paulsen tested his personal grit and drive in the Iditarod races. Like Joseph Campbell talks about, I think teens need a coming of age event to center their later years and to draw upon in times of difficulty.